"Best Wishes! 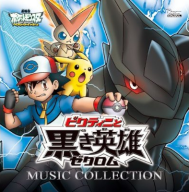 (Movie Edit)" (ベ ストウイッシュ！(Movie Edit)) is the opening theme to the films Victini and the Black Hero, Zekrom and Victini and the White Hero, Reshiram. Nee doko made susunderu ka na? Demo tanoshimi wa kazoe kirenai! Doki-doki wa sugu ni uzu-uzu ni! Ite mo tatte mo irarenai ze! Demo sugu honto no egao de ippai! Hitori janai kara nakama ga iru kara daijoubu!" What isn't new is this excitement! But there's no way I can count all the fun I'm having! I listen out for a familiar voice, a voice from the future. Yeah hey hey hey! Let's step out! Yeah hey hey hey! Shall we run for it? My beating heart is going to burst soon! I can't just sit here doing nothing! What I really wish would end is this anxiety! When we only have a vague idea of what's going on. Well, that's how friends are made! But before long there are plenty of real smiles. The wind carries my voice and my memories. I'm not alone and have friends with me so I'm alright!" Yeah hey hey hey! Will continue sparkling! This anxiety I feel will soon become excitement!